One category that caused interest - and a fair amount of comment - at the first British Charcuterie Awards in 2018 was ‘nduja – Class 5, Soft & Spreadable Products. It reflects the impact that this spicy Calabrian salami has in the UK and our producers are no doubt keen to meet the apparent demand from Charcuterie aficionados for the Hot and Spreadable. ‘Nduja keeps on popping up, whether on toast for an antipasto, in sandwiches or added by the spoonful to stews, sauces and soups, as a filling for pittas or topping for pizzas. I can’t help feeling that often, it is there purely to feed on its name and popularity with the public. In spite of this, it is worth looking into what ‘nduja really is and whether it is being faithfully represented by the myriad of products it has inspired. In its most famous and most satisfying form, ‘nduja is wonderfully soft, long aged & fiery from Calabria, specifically the Vibo Valentia region with the town of Spilingawhere most production takes place. Like many rustic salami, it traditionally makes use of what is available locally and economically. This led to a recipe that generally involved offal, fat and the peperoncini calabrese. The offal offered economy, the chilli peppers the distinctive heat and the fat longevity and spreadability. The mix is typically put into a large diameter natural casing, smoked and then air dried often up to 2 years before being broken open to reveal a wonderfully soft, rich spread. 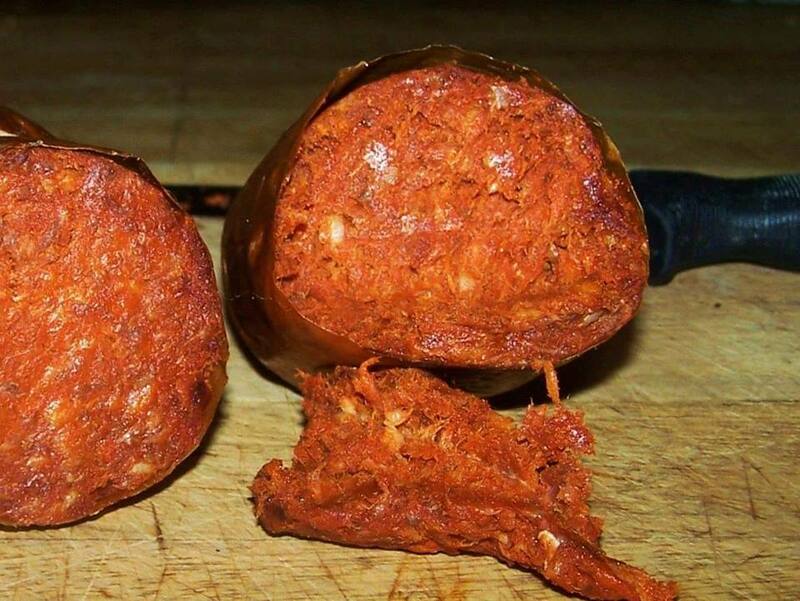 The traditional approach, briefly outlined above, lends specific qualities to a traditional Calabrese ‘nduja. The fat predominates, with its flavour and texture, but the lean content - made up of mainly fatty trim & offal provides a more mineral taste than typical muscle proteins. And then the lingering heat of the peperoncini provides a breath-taking depth of flavour, the sort of heat that should leave you wanting more. The general buzz around the product and the popularity of some of the commercially available Italian products has led to attempts to either faithfully reproduce the classic ‘nduja Di Spilinga or more loosely based variations on the theme. But what we found at last year’s British Charcuterie Awards was a very wide range of interpretations. Many products labelled ‘nduja were primarily associated with large amounts of heat and large amounts of fat as their key factors…and not much else. This throws up an interesting issue and one that we discuss regularly at international forums. When is a product no longer really that product? When does experimentation or variations on a theme reach a point where it is no longer recognisably what it is based on? My own take on this has always been fairly relaxed. We may know there is a particular specification that classifies a product as truly ‘nduja and like so many origin specific products, only if it is made with pigs reared in a certain place, possibly even of a certain breed, and manufactured in a certain place can it truly classified as ‘nduja. However, it is clear that many of us can make perfectly acceptable versions of such a product without needing to meet suchstringent criteria. Stunning products are now made in all over the world which remain faithful to the product’s original qualities and represent neither an appropriation nor alack of authenticity. These products represent a celebration of what is great about ‘nduja and, I would say, quite rightly carry the name. On the other hand, there are many products that I am not so sure meet the criteria. This not to say that there is anything inferior about them in principle, just that they do not conform to the specific qualities that make ‘nduja what it actually is. A spicy, soft salami is a perfectly interesting proposition and should be judged on its merits regardless of what it has been called. But the risk is that if a delicious product has been named after something it clearly is not, it can detract or, as we found on last year’s judging tables, get marked down. Many were the comments along the lines of “it’s very nice, but it’s NOT ‘nduja’” Such a shame that a worthy product would suffer such a fate. I have always actively encouraged makers who I know are working on such things to have the confidence to call it what it is, rather than seek to mimic something that it clearly is not. So, in conclusion, the world of spicy & soft salami is bigger than ‘nduja and there is no harm in making and marketing such products without feeling that the ‘N-word has to be attached. My advice for 2019 to all British Charcuterie Producers is that if you are intent on making an ‘nduja then do your research, do your testing and go for it! And I know some have already done this with really good, positive results. If, on the other hand, you are coming up with a product that may be soft, spreadable and spicy but bares no real relationship to the original, then give it your own name that reflects your own work and your own version.